Margaret Sonnemann spent most of her adult life battling a chronic illness. In her 50s, she trained briefly in landscape painting but finally found her artistic vocation when she gave free rein to her interest in human faces and ventured into portraiture. Margaret now specialises in portraits and genre paintings, which allow her to explore her life-long interests in physiognomy, manners and cultural minutiae. Margaret sees her art as an act of defiance against evil, as she seeks to draw our attention to everyday beauties and triumphs. In the tradition of the Impressionist painters Mary Cassatt and Berthe Morisot, she finds poignancy and meaning in the peacefulness of domestic moments. Margaret's most recent honour was the Premier's Choice Award for her self-portrait in the Material Girl exhibition which toured statewide this year. She is currently preparing for her first solo exhibition opening 29 March 2015. 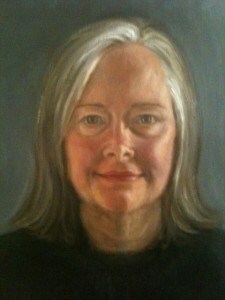 Margaret is the third generation of oil artists in her family so named, hence 3margarets. Margaret immigrated to Australia from the US in 1983 with her husband and small daughter. She has experienced the broad sweep of Australian lifestyles, in the Melbourne suburbs, on a sheep station in central west NSW, by the beach on the Sunshine Coast, a convict-built house in Tasmania’s Midlands restored over the course of 20 years, and is currently based in Tasmania's Huon Valley. “I began painting seriously quite late, around age 50, part of my new-found joy in life after a 15 year battle with a debilitating illness. After initially working with landscapes, I started painting portraits of local people in our tiny Midlands town. The first portrait I painted was of Punch, an old man who lived in a small house without electricity or plumbing. It was hung in the local pub, very close to where he sat every night. I found I especially enjoyed painting the bidders at the annual Tunbridge Sheep Sale as their faces reflected the joy and heartbreak of life on the land. Margaret's first book, The Aurora Chaser’s Handbook was recently released and is in its second edition. Margaret is founder and media contact for the Facebook Group Aurora Australis Tasmania (17,000 members). serves on the Tasmanian Home Education Advisory Council (THEAC). Material Girl: 2003, Women Tasmania’s International Women’s Day Exhibition. Her drawing “My Daughter’s Place” was selected to be part of the Tas Regional Arts state-wide touring exhibition. Material Girl 2014, Winner, “Premier’s Choice” Award for “Self Portrait, M” currently touring the State.